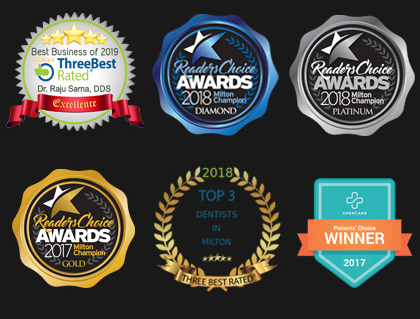 Hawthorne Village Dental Care in Milton has invested in the best technology available, to provide the very best care for our patients. When to comes to treatments like same day crowns and Teeth in a Day, there’s an essential element that makes this process possible: the iTero Scanner. If you’ve ever had an impression made of your teeth, you’re familiar with the gooey trays that are held in place for several minutes and then taken to the lab to create a replica of your mouth. With iTero Scanner, we use 3D scanning technology to capture the same impression — only better — using advanced digital imaging capabilities. Using a simple handheld wand, iTero scans each tooth surface to replicate it at extreme levels of accuracy inside of our computerized imaging system. From there, we can have an exact 3D dental image of your oral anatomy that will never break, dry out, warp, or need to be sent to a lab through the mail. By bypassing the 3rd party lab, we’re able to provide accurate and efficient restorative treatments right here in our office. iTero uses the same technology behind other types of CAD/CAM equipment. If you’ve ever experienced a 3D ultrasound or seen a 3D printer, you know just how far technology has come when it involves capturing three-dimensional data. Have you ever wished that you could see what a suggested treatment looks like before scheduling the appointment? With iTero, we can show you a virtual mock-up of what your dental procedure will change or improve in your smile. In some cases, it’s even possible to preview cosmetic treatments, veneers, or orthodontic treatment on the screen. A virtual smile makeover gives you the digital “before and after” photos of what your smile could look like, before planning the next steps. And thanks to iTero, it’s a service that we’re able to offer to our Milton patients. The digital impression capabilities of iTero allow us to transfer the virtual data into our in-house E4D milling equipment. Instead of waiting for your new crown, bridge, or implant restoration to be made off-site, it’s created right here in our office. Because iTero and E4D work together seamlessly, we’re able to create the most precisely fitting dental restorations ever offered to our patients. You’re guaranteed a perfect fit, because there’s no risk of human error or distortions in the materials being used. iTero makes it possible to for Dr. Raju Sarna to complete most treatments in a single appointment. Whether you need full mouth rehabilitation or a crown and filling, our same day digital restorations are made on site while you wait or catch up on other required dental needs. You can even elect to have sedation if you choose. Experience modern dentistry at its finest. Contact Hawthorne Village Dental Care in Milton today to experience iTero for yourself!